I’ve rounded up several unique planter ideas to inspire you this season. There are so many, from fun and whimsical, to fancy and practical. Rule of thumb: If it holds soil, and you can put a hole in it, then you can plant in it. These out of the norm planters, add tons of character and whimsy to your garden, and most are very affordable, if not free. Many are repurposed items, that you probably have in your basement, shed or garage. Others are things you can put on your list, for the next time you are out antiquing or checking out the flea market and local garage sales. The following are all images my blogging friends have shared with me along with a couple of my own. Click on the image to for more details. Planted old tree stumps and holes in trees. A tire swing with flowers planted in the bottom. Next time you clean out your basement, garage or Aunt Sophie’s house, consider re-purposing an item or two to plant some pretty flowers in. Patti – A nice selection of unique planter ideas…I need to get busy & come up with a couple new planter ideas for this summer. 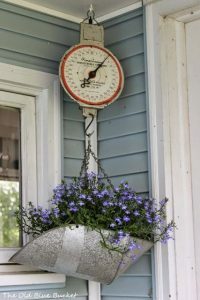 Thanks for including my hanging scale & washtub planters! So many fun and interesting ideas, with several from you. I’m curious to see what you come up with next.